Isn’t Dear Esther almost literally a walking tour of an island? Might be worth looking into, even if it doesn’t quite match the sort of gameplay found in Miasmata or Morrowind. I’ve heard it described as an audiobook tied to a walking simulator, but I’ve also heard the same platitude leveled at a lot of recent experimental games (Gone Home, Stanley Parable). I can’t really comment on them though, as I’ve not played them myself yet. I’m more a fan of action sandbox games – Assassin’s Creed, Arkham City, Prototype – all of which have either no or very sparse instant travel points. Instead, the travel itself is reasonably fast by nature. While they lack the diverse and sprawling terrain of an island setting, the gliding and leaping over rooftops and the urban architecture feels comparable to me. Perhaps the common overlap of interest here would be Just Cause 2 – a sprawling and vast island game, with a fast-travel system, but often so much more enjoyable to just hookshot and glide your way over, taking in the terrain as you go. Gliding is a much faster pace than the walking of the “frustrating” and “antiquated” Morrowind, without forfeiting the visual and interactive experience for loading screens and cutscene animations. Scaling snowy mountains and then leaping to glide all the way down, then on over to deserts and cities alike, remains joyous in spite of the multitude of drivable vehicles or the teleporting helicopter at your beck and call. I suddenly recall The Secret World, and the island of Kingsmouth. While TSW is an MMO and succumbs to all the foibles of one, musing on your post reminded me of jogging across the Lovecraft-Poe-and-King inspired rainy island, with its myriad of secret societies, cursed ships and haunted schools. For such a densely-packed theme park of horror attractions, it was surprisingly easy to just wander off the beaten path and engage in quests out of the way, or in entirely unexpected orders. Egypt’s hidden valley had similarly impressive design, albeit with a less diverse theme. The story there though was excellent, and well-presented, allowing you to speak to the various guardians in any order and really get a feel for their personalities and behaviours. Both felt like their landscapes had been designed with wandering and non-linearity in mind, but perhaps were restrained by the “level curve” that zones off all non-sandbox MMOs. Notably, neither had precise maps, but tourist maps with oversized features and scribbled notes, or blackened parchment with near-illegible diagrams. A number of investigation quests don’t have objective markers either, instead relying on your knowledge of terrain or places you’ve visited prior. The only fast-travel were the gates back to the hubworld, one per map, and the smattering of respawn points. 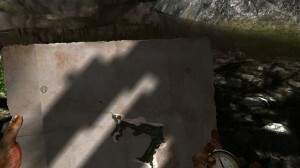 Admittedly, some players did abuse the self-kill “debugging” function to rapidly teleport about the map via the spawns. Honestly, in terms of transportation and world interconnection, Dark Souls remains the best case study – even once you do unlock sparse ‘warping’ shortcuts, the world retains its integrity. 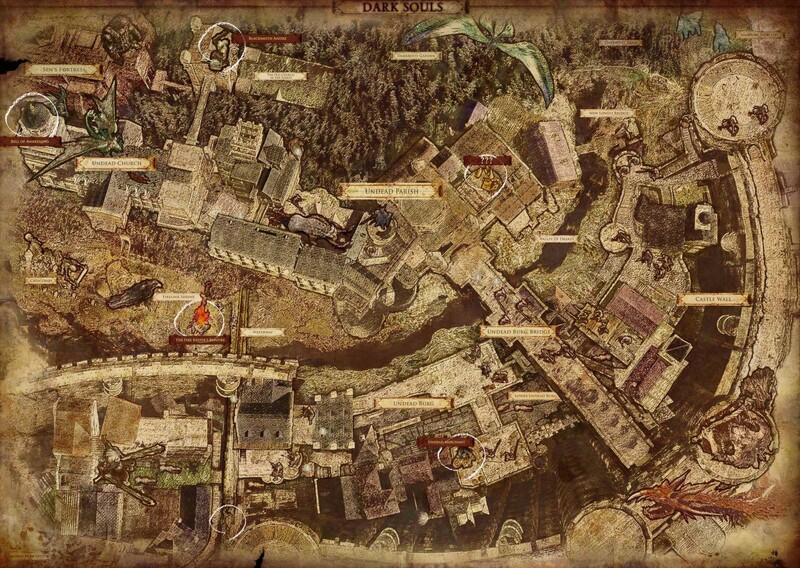 While wanderlust is less easy to indulge within Lordran’s corridors, caves and bridges, the interconnectivity of the Berg, Basin, Garden, Parish – everywhere seen on this map (http://img.neoseeker.com/mgv/14628/628/26/dark_souls_map_5.jpg), really, and a few more underground – continues to astound me. I wish I had more to say about it, but really, it’s hard to put into words how a game with no internal map can imprint its locations and geography so brightly onto the mind. I haven’t properly sat down and played it in some time, and yet I can still backroute my way to the second bell in my mind, and recall the locations of most equipment, without having had to obsessively memorize it. It just occurred naturally in a single pass of the game. I feel that game navigation and “world design”, rather than “level design”, is sorely under-appreciated by both players and developers, and has been for quite some time – those games that do create fulfilling worlds are definitely worth both celebrating and studying. Making a truly functional world goes beyond mechanics, aesthetics and narrative, and requires thoughtfulness and care in all elements of design. As you pointed out, even a simple new mechanic for the sake of alleviating frustration – fast travel – can have far-reaching impact on both the depth of the navigational experience and seemingly unrelated systems like alchemy and crafting. Apologies for the wall of text! I really appreciated this post and it got me thinking. And to think I nearly posted this as a Facebook comment before noticing the blog’s actual comment system… anyway, I’ve forwarded this onto a friend of mine who actually played Morrowind, so he’ll likely get even more out of it than I did. Thanks again! Cheers for the huge reply! Definitely agree with you about world design. I wanted to try and tease out some of the reasons why Morrowind & Miasmata play so similarly while, say, Oblivion feels so different, and I think so much is down to travel systems and the way they change the player’s movement through the world. And the way that affects repetition, too. Worlds have to be much deeper if your players are seeing them slowly over and over again, which tallies with what I hear about Dark Souls. I have to admit I haven’t played Dark Souls half so much as I should have. It’s the sort of game I ought to love, but just never quite got to the point of falling for it before the frustration felt too much. That’s partly to do with not having as much time to spare as the game needs, I think. Dear Esther, though, yes, definitely shares the same sort of wandering. But like Proteus it’s much less directed, much more wandering and much less purpose. You’re trying to uncover information out of character, rather than gathering things/info in character, so that wandering feels much more player-directed, I think? If that makes sense? TSW’s coordinates system for some of its puzzles is brilliant for the other sort of directed meandering, with a goal and a purpose dictated by the game rather than the player. But because of the MMO-curve you mentioned it doesn’t require much in the way of resources, at least early on, so bits of Kingsnorth feel more like overt gating systems than organic things growing out of the landscape. Almost the precise opposite of Proteus, I guess. Next Next post: ibis, fly!